Clarify customer complaints before inspection. First of all, perform an interview utilizing stc-20, "diagnostic work sheet" and reproduce symptoms as well as fully understand it. Ask customer about his/her complaints carefully. 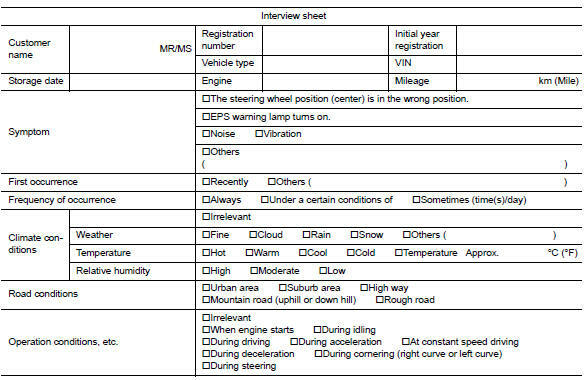 Check symptoms by driving vehicle with customer, if necessary. Customers are not professional. Never guess easily like вЂњmaybe the customer means that...,вЂќ Or вЂњmaybe the customer mentions this symptomвЂќ. Reproduce the symptom that is indicated by the customer, based on the information from the customer obtained by interview. Also check that the symptom is not caused by protection function. Refer to STC-13, "Protection Function". When the symptom is caused by normal operation, fully inspect each portion and obtain the understanding of customer that the symptom is not caused by a malfunction. Is any dtc detected? Yes >> record or print dtc and freeze frame data (ffd). Go to 4. No >> go to 6. Perform dtc confirmation procedures for the malfunctioning system. If some DTCs are detected at the same time, determine the order for performing the diagnosis based on STC- 14, "DTC Inspection Priority Chart". Is any dtc detected? Yes >> go to 5. No >> check harness and connectors based on the information obtained by interview. Refer to gi-39, "intermittent incident". Reconnect part or connector after repairing or replacing. When dtc is detected, erase self-diagnostic results for вЂњepsвЂќ. Estimate malfunctioning system based on symptom diagnosis and perform inspection. Can the malfunctioning system be identified? Yes >> go to 7. Check the reference value for eps control unit. Recheck the symptom and check that symptom is not reproduced on the same conditions. Is the symptom reproduced? YES >> GO TO 3. In general, customers have their own criteria for a problem. Therefore, it is important to understand the symptom and status well enough by asking the customer about his/her concerns carefully. To systemize all the information for the diagnosis, prepare the interview sheet referring to the interview points. In some cases, multiple conditions that appear simultaneously may cause a dtc to be detected.